Join this monthly online community for an orientation to the philosophy and methods of Kingian Nonviolence Conflict Reconciliation, to dive deep into Dr King’s writings, and to explore its applications for today! 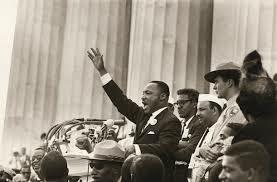 Dr. King was more than a man with a nice dream. He was an organizer, a radical, and a revolutionary who called the US government the “greatest purveyor of violence in the world” and demanded “radical redistribution of economic and political power.” Above all, he taught us that love is the most potent weapon at our disposal. After his assassination, Dr. King’s philosophy and methodology were synthesized by Bernard Lafayette, Jr., and David Jehnsen into a methodology called Kingian Nonviolence. • Read selections from all five books authored by Dr. King, supplemented with readings by or about women in the movement (JoAnn Robinson, Barbara Ransby (Ella Baker), Dorothy Cotton, Coretta Scott King). This is the first phase of a three-part series. Future Nonviolence Book Clubs will cover readings and philosophies that influenced Dr. King’s philosophy (Phase II), as well as books that explore contemporary nonviolent movements & organizing strategies (Phase III). An online orientation to Kingian Nonviolence will be offered before each phase, and people take the Phases independently of each other. Cost: $150, payable in full by the time of first participant check-in (June 22). $50 deposit to register. Limited scholarships may be available; use Contact link below to get in touch with organizers. All books are available in public libraries or via Interlibrary Loan. Many readings are also available online. A full list of complementary readings will be available in early June. Book club organizers will use a platform called Zoom, that allows you to call in or use a webcam. We strongly request webcam to maximize community-building. Participants using webcam need access to a computer with speakers and a mic, as well as a stable high-speed internet connection.